One of the things that has long made Robin such a popular character is the idea that under the right set of circumstances, anyone could become Robin. It’s a simple notion that has helped to keep the Boy Wonder going strong for 75 years, and nowhere is it more apparent than in We Are Robin, the brilliant new reinterpretation of the youthful hero written by Lee Bermejo and drawn by Jorge Corona, Khary Randolph and Rob Haynes. 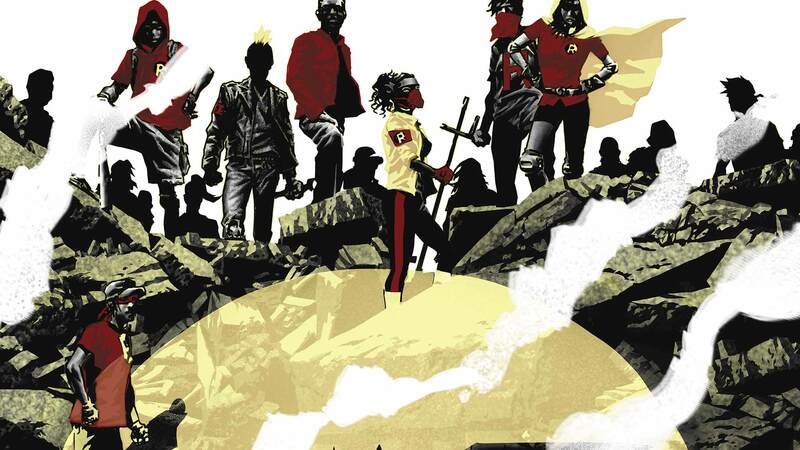 Shifting Robin from a singular hero to an entire youth movement, We Are Robin offers a fresh, exciting approach to heroics that’s unlike any other book on the stands. With WE ARE ROBIN #3, arguably the best issue of the series so far, now on stands, with thought the time was perfect to talk to Bermejo about how the whole thing came together. I have to say, I personally love this book. It’s just a great idea. How did this project come to be? Let’s go back in time three years. When I was finishing BATMAN: NOEL, I had an idea for something that was like a “Robin: Year One.” I think I wrote 48 pages of it just for myself. Mark Doyle was the assistant editor at the time and I showed it to him. I just wanted to get his feedback on it and we talked about it at length, but it never fit the continuity. The New 52 was just starting, and my idea wouldn’t have fit at that time. So it really was something in the zeitgeist, and we jammed on the idea and utilized ideas from my original pitch and made them work. There are quite a few of these Robins. How many of these are we going to get to know going forward? I’m focusing on six characters, but there are many references to other characters that are out there, and you’ll see an army of these guys in issue #3. I definitely want people to know that this is a youth movement in Gotham that a lot of kids are involved in, but you can’t easily tell a story about 100 kids, you have a focus on a crew. And the reason why I’m focusing on these kids is addressed in the story. With this new group of Robins, where does Damian Wayne fit into this? Will the upcoming Robin War address this? Oh yeah, it’s crossing over into We Are Robin. We knew from the beginning that if there were a bunch of these JV Robins out there, at some point they’re going to have to run into the Varsity team. Part of the timing of the [Robin War] event was obviously to commemorate 75 years of Robin, but it really works out perfectly for my book because I needed to have that moment where they have a one-on-one—or in this case many-on-one—confrontation with a Robin. That is definitely a piece of the puzzle that I knew I had to work in at some point and this event is a perfect way to do that. Along with being a fun comic, your book also addresses a lot of social issues. Was that planned from the start, or was it added in response to what you were seeing in the world? I think it’s a combination of things. I think these characters are so mythic, you can now get very meta with them, where they almost reference themselves in the books because they’ve taken on that part of American mythology. I think even within the universe they’re such a huge part of the people of Gotham’s lives that it makes sense that something like this [Robin youth movement] would happen. And the other real world side of it is I just think that now so many people’s voices can be heard so much easier with social media. There’s stuff going on right now that enables us to hear about a lot of things that maybe twenty years ago wouldn’t have been on our radar, so that’s part of it too. It’s definitely in the zeitgeist right now. So how long has this movement been going on? It seems like it’s been there for a while when We Are Robin begins. I feel like that’s the way most people interact with any kind of movement. Your average person isn’t there at the beginning, they’re made aware of something after it’s started. So I wanted to have a character that could be pushed into the movement or choose to be a part of the movement in the same way you would if you were living the story. I like that everyman quality of it where maybe there’s a little mystery around how and why it started, but as the book goes forward what we really are addressing is why it’s important: Why is something like this important in Gotham City right now, where you have a police-governed Batman? The youth of the city might feel a little disenfranchised. Is any of the story pulled from real life? Are you inspired by real life events? In SUICIDERS, a lot of it is. Obviously, it’s fantastical and it’s not a direct reflection, but a lot of that stuff is really from my own experience, from my dad’s experience, from various people I know. I try to do that whenever I can so there are specific characters in We Are Robin that are going to have some of my family’s experience. There’s going to be a bit of that in there, but for the most part I’m just trying to create characters that come from different backgrounds and use it as a chance to show different approaches to what it is to take on that role. I’m really interested in this idea that you had a bunch of Robins in the past that for the most part have all kind of looked the same. I’m interested in what happens when you give a young Latina a chance to take a crack at Robin. You know what I mean? That’s interesting to me. Do you have a favorite Robin of all the ones that have existed up to this point? I do. I’m a big fan of Carrie Kelly, but I’m also a big fan of Jason Todd. He was my Robin when I was heavy into reading Batman as a kid, but I also like the tragic nature of that character. I think that’s interesting and how that character more than the other Robins has shaped Batman in a major way. Do you think Batman needs a Robin? Absolutely. I didn’t, and this whole project has completely made me readdress that. The original Robin concept I had was me trying to make sense of this idea that he runs around in a little colorful costume and he’s a teenager. Why is this adult trusting and partnering with this kid? The concept of a teenage sidekick makes no sense to me, so this is just my attempt at a solution to that problem. WE ARE ROBIN #3, by Lee Bermejo, Jorge Corona, Khary Randolph and Rob Haynes, is now available in print and as a digital download.